Jimmy's Fish House, off the Clearwater Florida beaches, has good food, soft reggae music, and a great view. We went here for dinner on Saturday. It was the hottest day of the summer so far, about 94 degrees with above 80 percent humidity. The heat index was over 100, but we had a seat right next to the Gulf and the breeze kept us comfortable. We were right by the rail on the seawall and had a great view of the bridge spanning Clearwater Pass, boats and Sea-Doos running in and out, an older couple fishing about 50 yards off the shore and a group of guys playing catch with a football in the Gulf. 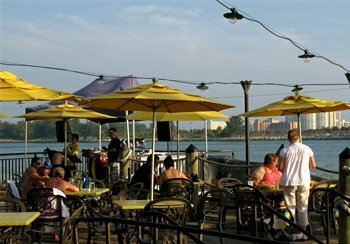 Even though it was smoking hot for Clearwater Beach at 6:45pm on this June day, we elected to eat outside on the patio. Our hostess took us down to a table shaded by a large palm tree right next to the seawall buffering the Gulf of Mexico, just west of Clearwater Pass. Our waiter, who was sweating like he'd been playing soccer, was right on top of things and had water for us in a minute. It was hard not to be impressed by the young and friendly service staff who were working like they were assigned to the inside dining area. They certainly set a positive tone for our dining experience. 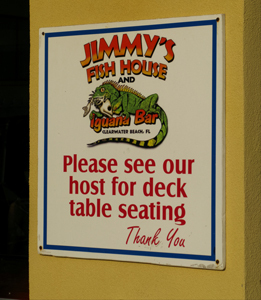 Jimmy's Fish House advertises: "Our specialty is serving you fresh food in a fun, upscale waterfront atmosphere!" The band, a duo called Both Worlds were not only talented singers, they could also play a variety of brass instruments to compliment their songs. Their play list was composed of light, tropical Reggae selections that were at the perfect acoustic level. They were loud enough so we could understand the lyrics, but soft enough that we could carry on a quiet conversation. This is a rarity on Florida beaches where many bar bands confuse intense decibel level with quality music. These guys were outstanding. * We understand they play here every other week so it might be a good idea to call first to make sure they are scheduled. 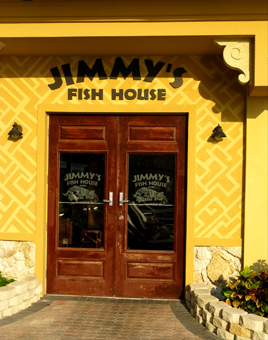 Jimmy's Fish House is geared towards fresh seafood...and they have quite a menu. We split the Caprese Salad and the Island Chicken Wrap...and we were stuffed. Nothing was skimped on these menu items. How people could eat a whole wrap is beyond me. There is a big chalkboard with the day's fresh seafood selections. You can have them Grilled, Jerked, or Pan Seared with one of their five specialty sauces. With the backdrop of the Gulf of Mexico, the smooth and lyrical Reggae music, and the innovative tropical drinks to balance the fresh seafood, Jimmys pretty much created the atmosphere they were shooting for. We couldn't have asked for a better Clearwater Beach dining experience.